Reader raises an issue with the data for warranty reserves, claims, and accrual statistics published over the past five weeks, suggesting the use of just printer hardware revenue to compute a claims rate paints a misleading picture. We read with interest the "Warranty Week 500" in the Sept. 8, 2003 issue, and believe it's impossible to compare different companies with their varied reporting methodologies on an "apples to apples" basis. Therefore, we believe the ranking of Lexmark International Inc. was not only not comparable, but was misleading. For Lexmark, the math was fairly simple. You took our reported warranty costs for all products and supplies for the six months ended June 30, 2003, and divided them by only our core laser and inkjet printer revenues. We feel that our core supplies revenue and other revenue -- which includes dot matrix printers, and supplies for dot matrix, dot band, and other laser printers, all of which drive warranty expense -- should have been factored into this calculation. In short, all three revenue categories -- core hardware, core supplies and other -- contribute to our reported warranty costs and should have been factored in. If you factor in these other warranty-related revenues, and thereby treat us on an "apples to apples" basis with others, our warranty costs as a percentage of revenues would drop to 3.8% rather than the 10.9% you reported, a significant difference. I would further point out that the warranty expense is comprised of both base warranty expense and extended warranty expense. Also, in Lexmark's case, we also include administrative costs, something that's not done by all the companies on which you reported. As a result, depending on how aggressive a company is in driving its post-warranty services business, this can significantly change the reported warranty expense, and has nothing to do with the cost of base warranty. Therefore, we think it's very difficult to compare different companies. 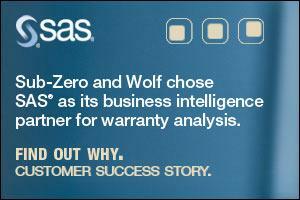 In an ideal world, each manufacturer would report its own warranty accrual and claims rates. However, the procedure outlined in paragraph 14 of FASB's Financial Interpretation No. 45 is to report just the net amount in dollars spent honoring claims and the net amount in dollars added to the reserve fund. It is up to the financial analysts and newsletter editors of the world to turn those dollar amounts into percentages, based on whatever additional information is available. Each company also must now break out their total revenue into identifiable segments, but again the regulations allow each company to decide exactly how. Some companies do a good job of providing revenue figures by division, by geography, and sometimes even by product line. Many manufacturers, particularly those with significant service or consulting operations, break the top line in their income statements into products and services. Those in the homebuilding industry and some vehicle manufacturers also break out the significant amounts of revenue they derive from mortgages and other loan arrangements. But some manufacturers provide only geographic information for their total revenues, thereby frustrating any attempts to subtract out non-warranted product revenue, service revenue, consulting revenue, interest income, and other items from the warranty claims rate calculations. What I am after is the ideal: a true rate for warranty claims. 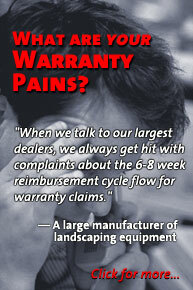 How many dollars of each $100 in warranted product sales is consumed by subsequent warranty claims? In Lexmark's case, the number used in the denominator of the warranty claims rate calculation was the $770 million reported for laser and inkjet printer revenue during the six months ended June 30. This figure was found in the second paragraph of the "Results of Operations" section, Item 2 in the Form 10-Q filed with the SEC in mid-August. The figure used in the numerator of the calculation was the $83.6 million reported in Note 5 of the same document, under "settlements made (in cash or in kind) during 2003." This resulted in the 10.9% rate reported in Warranty Week. Using total revenue in the denominator would of course lower the claims rate for all companies, unless all a given company's revenue arose from warranted product sales, and none arose from interest, consulting, service, royalties, or consumables. In Lexmark's case, as in the chart below, the claims rate falls significantly when claims are divided by total revenue. But I doubt the value of comparisons based on total revenue, especially with IT companies such as IBM, Sun Microsystems, Lexmark, Silicon Graphics, and Storage Technology, where the difference between the two rates is significantly higher than one percent. Readers who agree or disagree are encouraged to write to the editor, either for publication or not. I would rather everybody report their segments with Lexmark's detail than to go back to using total revenue. I would rather compare the claims rates for red apples with red apples, and green apples with green apples, than have to go back to comparing all fruit. And I would rather not include the weight of the wooden crates the apples come in. Still, as a courtesy to Lexmark, below are the rates for both total revenue and product revenue, and the claims rates based on each. Lexmark's total revenue over those six months was $2.2281 billion. But that figure includes a significant amount of printer supplies, which by their very nature are designed to be consumed and replaced. They are products, but they are not warranted products. That they can drive warranty costs is a point I had not considered. I guess that would be analogous to faulty vacuum cleaner bags causing warranted repairs of vacuum cleaner units, bad oil or gasoline causing automotive breakdowns, or perhaps the old classic marketing example of the razor handle and the razor blade business model. But here's the problem: when making comparisons of claims rates across industries, one would want to subtract out all those consumables from the calculations. Ideally, manufacturers would reveal the amount they accrue per new unit sold, which would imply the claims rate they expect for that product line over the warranted lifetime of the unit. But of course, this is not done. I feel that if manufacturers were to add into that the volume of consumables they expect the unit to consume -- for instance an automaker estimating the amount of gasoline and oil a new car would use in its first 48 months or 48,000 miles of warranted life -- that would complicate rather than simplify the calculation of a true claims rate. Yes, a bad batch of gasoline could make the engine seize, but gasoline is an aftermarket consumable. In the printer business, I suspect that the actual unit price of the hardware is set low to begin with, for which higher supplies prices compensate over the life of the product. In the extreme case, a printer company could possibly remain profitable even if they gave away the printers, if they could maintain a tight monopoly on the aftermarket consumables. In that case, they would have an infinitely high claims rate. In Lexmark's case, only 35% of total first half revenue was reported for laser and inkjet printers, while 57% was for laser and inkjet supplies. That level of disclosure allows a fairly exact calculation of product warranty claims divided by warranted product revenue. But it is not meant to embarrass anyone. The 10.9% rate may look high, but through a combination of low printer prices and a business model that emphasizes the aftermarket supplies business, it may be both natural and sustainable for printer hardware to incur a 10% claims rate. The problem, and I think we agree about this, is when one tries to compare one company to another. Because of this segmenting problem, and because in reality all we have so far is six months of FASB-mandated claims and accrual data, I think we lack the means to compare companies. Yes, between comparable companies one can make comparisons, but for every Ford/GM or Palm/Handspring pair of alike companies, there's a Boeing and a United Technologies, which are similar over only a fraction of their product lines. Hewlett-Packard, fortunately, does not make either elevators or air conditioners. Yet they compete up and down the IT spectrum: with Palm and Handspring in the PDA market, with Dell, IBM, and Gateway in the PC market, and with numerous companies in servers, data storage systems, and other markets. And yes, they're a huge printer manufacturer that directly competes with Lexmark. But I would never make a leap of logic and assume that HP's claims rate is comparable with Lexmark's, or, heaven forbid, that HP's printers are somehow two-and-a-half times better than Lexmark's, because its company-wide claims rate is two-and-a-half times lower. First of all, HP does not break out its revenues in the same fashion. HP reports that $11.14 billion of its first half product revenue came from the Imaging and Printing Group, which is the segment that most directly competes with Lexmark. Overall, 81% of HP's total revenue came from "products," while 31% of its total revenue came from IPG. But the printer group's share of just the product revenue was 38%. In addition, more than $1.8 billion out of a total $2.4 billion in net profits came from IPG -- almost 77%. What HP doesn't disclose is the share of that revenue attributable to printer consumables and other supplies. One could assume that it's in the 50% range, but it could be 45%, 55%, or even 60%. Your guess is as good as mine (most likely better than mine). Furthermore -- and here's the key piece of missing data -- HP does not disclose what fraction of its warranty cost arises from the IPG product line. Is it 31%? Or 38%? Or perhaps it's 77%? Take your pick and make your best guess for the company's printer warranty claims rate. I can make it vary between 8% and 12% just by changing my assumptions. On the one hand, then, there's Lexmark with detailed segment data and a "pure play" product line that suggests 10% is a good ballpark number for printer-only claims rates. On the other hand are competitors such as HP, Xerox, Kodak, and others that report their segment information differently, and for whom printers and printing is only a fraction of the product line. The truth is that each and every percentage on the chart above deserves an asterisk next to it that points the reader to a detailed explanation of the methodology behind its calculation. At the end of these notes should be a warning that companies with unlike product lines and different mixtures of product, service, and financial revenue are not comparable. What I think is already becoming possible is the use of available data to create a baseline for a company or an industry. Yes, the presence of a diverse company such as HP in printers or United Technologies in air conditioning complicates the calculation of natural claims rates for those industry segments. But when one looks at the "pure play" figures of a Lexmark, Lennox, or York, one sees something approaching a true industry claims rate. Also, even with only two quarters of data, it's already somewhat possible to detect when a given company's claims rate diverges significantly from the baseline. With multiple years of data, it will become even easier to detect anomalies that suggest either quality breakthroughs or manufacturing problems -- the goal of the government collecting all the automotive claims data for the TREAD Act's Early Warning Reports. I should also mention that a significant percentage of the printer industry is missing from the chart. Printer importers and other foreign-owned manufacturing companies are not required to file Form 10-Q or 10-K reports with the SEC, and therefore they do no disclose any warranty data. That means companies such as Brother Industries Ltd.; Canon Inc.; Matsushita Electric Industrial Co. Ltd.; Minolta Corp.; NEC Corp.; Oki Electric Industry Co. Ltd.; Ricoh Co. Ltd.; Seiko Epson Corp.; Sharp Electronics Corp.; and Sony Corp. are not part of this chart. In the Sept. 29 issue of Warranty Week, it was incorrectly reported that General Electric's room air conditioners were manufactured by Trane. That sentence has now been removed from the online edition, and the following paragraphs explain why. Trane has been in the air conditioning business since 1931, when it installed the Trane Unit Cooler into movie theaters in two Midwestern cities. In the fall of 1982, Trane acquired General Electric's central air conditioning line of business, along with its manufacturing facilities in Tyler, Texas,; Trenton, New Jersey; and Fort Smith, Arkansas. In early 1984, Trane itself was acquired by American Standard Inc. According to the Trane Web site, products manufactured today in the Tyler factory include residential heat pump and residential air conditioning systems. Products manufactured at the Trenton facility include residential furnaces and air handling equipment. The Fort Smith facility manufactures residential packaged products and light commercial unitary equipment. Trane Residential Systems, which today remains based in Tyler, also now has manufacturing facilities in Monterrey, Mexico, and Vidalia, Georgia. GE Appliances, meanwhile, continues to sell room air conditioners. Your editor confused this line of business with some others that GE sold off years ago, but which today in some cases continue to display a GE brand name. For instance, in 1988, General Electric sold its RCA and GE consumer electronics businesses to Thomson Consumer Electronics. Now known as Thomson Multimedia, the company even today sells items such as residential phones, televisions, and other home entertainment gear that carry the RCA or GE logo, which Thomson licenses from General Electric. Thomson, as the manufacturer, remains responsible for the warranty on those items. Two Republican lawmakers seek TREAD Act exception for small trailer manufacturers, inserting language into a transportation appropriations bill that passed the House. Apexon Inc. announces Product Quality Planning, a Web-based solution for global manufacturers that offers strategic and proactive quality assurance that reduces design-to-production time and improves product quality predictability. Warranty, no guarantee: The collapse of National Warranty Insurance Group raises new questions for consumers about the reliability of extended warranties -- a big business with limited regulation. Syncata Corporation releases new versions of its CoreTREAD Reporting Engine and TREAD Reporting Engine, aimed at vehicle and equipment manufacturers looking to comply with NHTSA Early Warning Reporting requirements. Gedas USA signs Cypress Corp. as partner for document management services aimed at IT firms. New chip in IBM laptops detects sudden drops, parks hard drive heads before unit hits the floor, avoids damaging data, and cuts warranty costs. Vancouver, Canada-based World Wide Warranty changes company name to W3 Solutions and redesigns Web site to include information on its extended warranty management services in both English and French. VAC Service Corp. promotes Jeff Hayden, Barry Gosset, and Catrina Beader to new positions.